Abstract: The implementation and refund delays under the new tax regime of Goods and Services Tax (GST) seem to have led to working capital constraints for firms, which in turn might have hurt their exports in October 2017. We provide evidence supporting this hypothesis using sectoral data on exports and find sectors that have high working capital requirements took the maximum hit during this period. However, various initiatives by the Government of India since then appear to have significantly alleviated exporters’ concerns which got reflected in the exports growth pick up in November and December 2017. India embarked on a new tax regime from July 1, 2017. With the advent of the new indirect tax structure, there has been a growing interest to understand the impact of the new regime on business activity in the economy, both in the short and long run. The GST implementation, in the beginning, was marred by infrastructure snags and implementation delays, which led to changing the date of filing tax returns for July multiple times. Finally, firms were required to file their returns by 30th September under the last revision. As per the implementation of the tax regime, exporters were supposed to get 90% of the input tax refund within seven days of filing their returns. However, there had been significant delays in receiving the input tax credit according to various reports, which could have adversely affected the working capital of firms. This implies that the sectors with high working capital requirements could have been hit more severely due to non-refunds than those with low working capital requirements. To elaborate further, the impact of the implementation issues is more evident and severe for the exporters. Prior to GST, the exporters were upfront exempted from paying any duties. Now, under GST, they are required to first pay the tax and later claim refunds. This constrained their working capital, at least once after the regime switch, since exporters would have had to adjust to the new tax regime. Under GST, they can avail 90% of the input tax refund within 7 days, but only after the goods are exported out of India. The refunds filed in the month of July were sanctioned to the creditors only in late October and November (CBEC Report). This could have jeopardized the working capital financing of the firms during the intermediate period between filing and refunds. If the first round of refunds got blocked after tax filing in September, it would have started hurting the firms’ working capital only around October 2017. 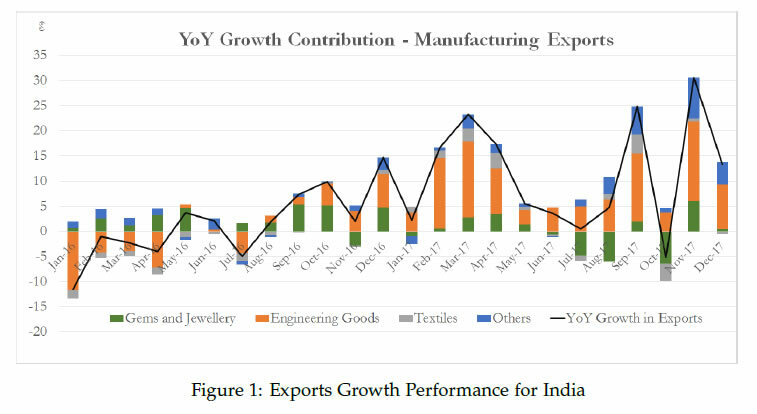 This is reflected in the exports growth number in October 2017, which declined to -1.2% (year-on-year) as shown in Figure 1 and was broad based. The relationship between the financial health of firms and exports decision has been widely studied in trade literature. Beginning with Greenaway et. al. (2007) and recently Wagner (2014), there has been ample evidence that exporting firms are less financially constrained than non- exporting firms. This study is different from the above strand of literature because it analyzes the immediate impact of a temporary shock to exporters, which has negative effect in the short run but might not have any long run impact. Interestingly, exports growth showed a big revival in November and increased by 30.5% (year-on-year). This is partially explained by the base year effect of low exports in November 2016 (demonetization month) and active intervention of the government in expediting the refund claims of the exporters in November 2017. In December 2017, exports growth stood at 13.3%, showing signs of continued growth, albeit, with moderation. In the next section we present the data and the methodology. Section 3 provides the main results, while section 4 explains the exports rebound in November and December 2017. Section 5 gives robustness results and preliminary evidence for our hypothesis from firm level data. Finally, Section 6 concludes. Were the sectors with high working capital requirement more severely hit by the lack of tax refunds than the sectors with a low working capital requirement? We answer this using trade data for exports which are available on a monthly level. We use the monthly trade data on principal commodities published by the Ministry of Commerce. The production information for the domestic economy is not available at a monthly frequency and hence similar analysis cannot be performed there. Apart from information on trade, we also used data on working capital at the sectoral level. We calculate it using firm-level data from CMIE Prowess, which primarily consists of publicly listed firms as well as some private limited companies. We calculate the average working capital to sales ratio for each firm active during 2010-2016 and then use the median for all firms as the benchmark sectoral ratio. After matching the two data sources, we are left with a total of 17 sectors. We have listed the median working capital/sales ratio for various sectors in Table 2. 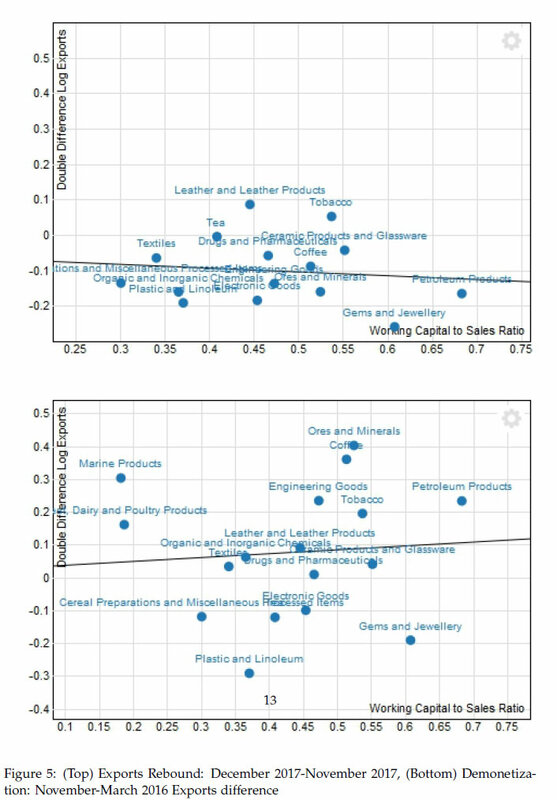 The sectors related to food products, like Marine or Meat, Dairy and Poultry, are less working capital intensive and have the lowest working capital/sales requirement. Electronics and Engineering goods sectors are median in terms of this requirement, while Gems and Jewellery and Petroleum have the highest need for working capital. We believe that differencing against January, February or March 2017 is the most suitable one for this exercise as it avoids November and December 2016, the period of demonetization, as well as the months just prior to July, when GST was implemented. The months around demonetization and those just before GST implementation were marred by policy breaks and could bias our results. 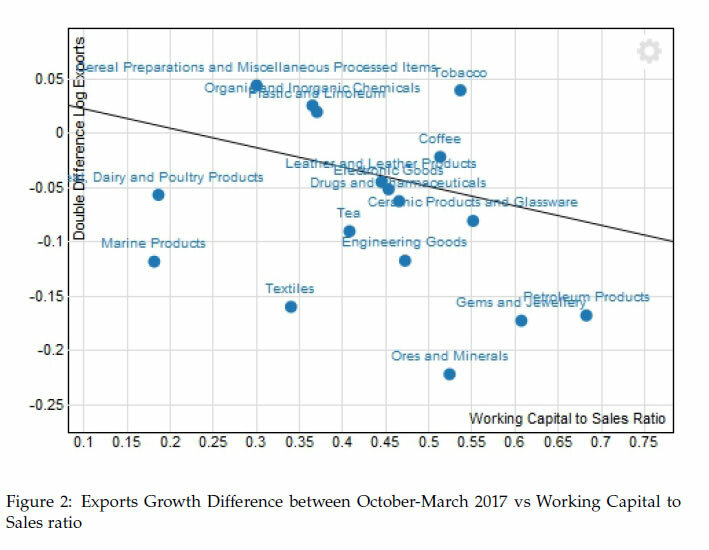 We give the scatter-plot of the difference in exports growth between October and March vs working capital to sales ratio in Figure 2. Each dot on the plot represents a sector. 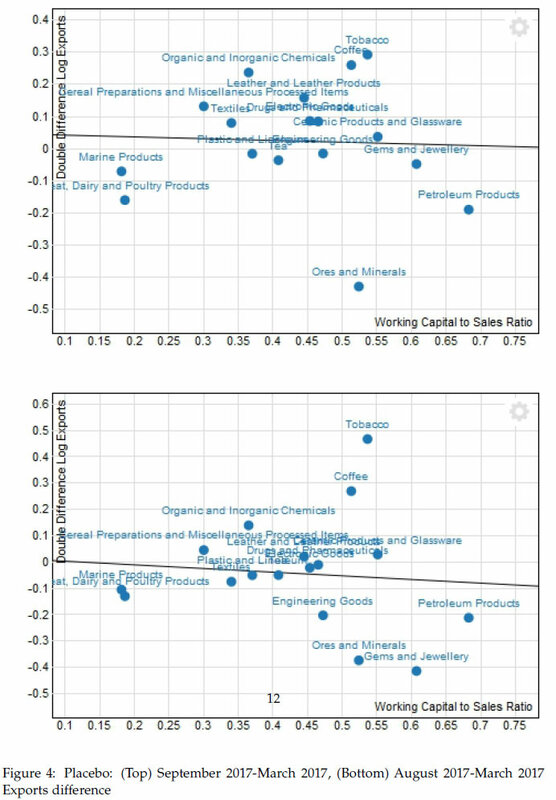 We can clearly see that the relationship between the difference in export growth and working capital to sales ratio is negative in this graph and has a slope coefficient of -0.18. Notwithstanding the data limitation, it roughly implies that a 10% increase in the Working Capital/Sales ratio led to a 1.8% decrease in the exports growth. Thus the sectors with high working capital to sales ratio indeed took the biggest hit in exports growth between March and October. For example- Petroleum and Gems and Jewellery have the highest working capital/sales requirement and they were hit the most during October as reported in Table 2. Meat, Dairy and Poultry on the other hand have low need for working capital and saw one of the smallest decrease in exports growth. This result is robust and consistent even if we take a difference between October 2017 and other months like January or February 2017. But this graph is not sufficient to establish the causality as it is possible that we are getting this relationship due to some other event which might have happened around the same time. To rule out such possibilities we do a placebo test in order to further establish the relationship. Given that the GST filing was supposed to be completed by the end of September, so, working capital constraints would have hit the firms only towards the end or post- September, when the refunds became due. We can thus use the growth difference for August and September with March and test if a similar relationship holds with working capital to sales ratio. Post dismal performance of exports in October, November 2017 exhibited a whopping 30.55% growth. This is one of the highest growth rates observed in the exports in the last two years. There are two possible reasons for this export rebound: (i) fast-tracking of GST refunds and exports sops and (ii) lower base of export growth in November 2016. The exports growth in November 2016 was dismal at 2.6% and hence delivered a favourable base effect of 14.2% for November 2017. The rest of the exports rebound can thus be accounted for by the fast-tracking of GST refunds in November thus ending the period of economic uncertainty which affected firm’s decision making after GST implementation. Post export slowdown in October 2017, apart from expediting input credits the government also announced a slew of measures to check export deterioration3. According to the recent press release by the Central Board of Excise and Customs (CBEC, 29th November 2017), the majority of tax credits filed in the month of July have now been sanctioned in November. The report claims that CBEC has been working "seemlessly" to credit the IGST refund claims to the tune of Rupees 6500 crores for the month of July, August and September. We think that the expedition of GST refunds for exporters through active intervention by the government slackened the working capital constraints, thus allowing the exporters to finally fulfill their delayed export orders. This explains some part of the sharp rebound in exports growth in November 2017. December 2017 numbers also continue to follow the increased trend. Since the working capital constraints got relaxed during November 2017, the high working capital sectors which were the most constrained in October 2017, should return to their long run growth path and register the biggest jump in their exports growth in November 2017. 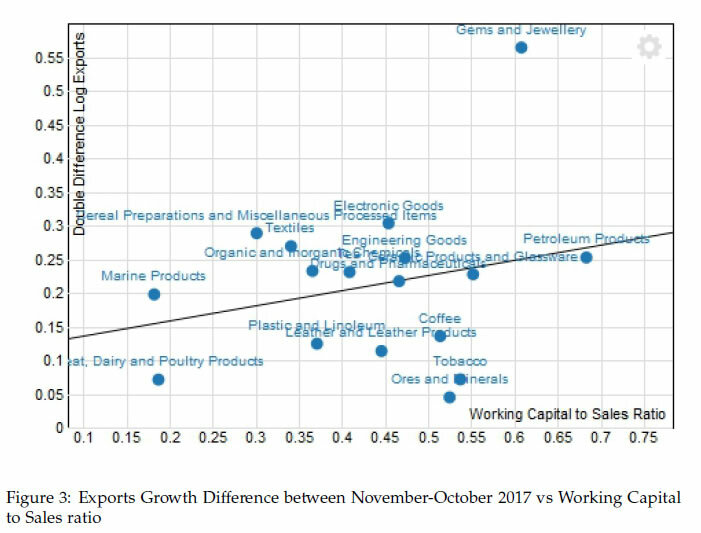 This can be seen in Figure 3, where we plot exports growth difference be- tween November-October 2017 against the working capital to sales ratio. We find that indeed the sectors with highest working capital requirements showed the highest exports growth rebound in November 2017. Also, the exports growth difference between December- November 2017 does not depend on working capital (Figure 5, top) thus implying that working capital constraint lost its significance in predicting sectoral exports growth in December 2017. Both these graphs provide further evidence that the GST shock led to one period deterioration in exports growth. To further dig into this issue, we looked at firm level data from CMIE Prowess to find firms’ reaction to working capital constraints, or whether such constraints actually hit the firms in Q3 and Q4 2017 (we are using calendar year notation in the whole analysis). We used quarterly data from Q1 2014-Q3 2017 as reported in interim financial statements by firms. Since the firms showed negative exports growth in October, any financial constraints should be reflected in the financial statement prepared at the end of Q3 2017, i.e., September 2017. We also find that in Q3 2017, firms reduced their ‘cash and bank balance’ during this period as reflected in β1 coefficient in columns 3 and 4, although, in this case working capital/sales ratio plays no role in firms’ decision-making as reflected by the fact that β2 is not significant in both these specifications. The results on cash and bank balance is fairly robust as Q3 2017 is among the few periods where the dummy variable on quarter is significant. Lastly, the quarter dummies are negative though insignificant in the case of capital expenditure as shown in columns 5 and 6, which suggests that capital expenditure was not a dominant channel in this period..
** Significant at 5%, *** Significant at 1%. Errors clustered at firm level. Given these results, we can conclude that firms primarily ran down their cash and bank balance during Q3 2017 in response to the GST shock. Lastly, it is important to mention one caveat here. Ideally, we would like to run this analysis for exporting firms, given that the results reported in the previous section were about exporters. But our sample has very few exporting firms that report quarterly results, and so we cannot do a robust analysis by restricting our sample to just the exporting firms. This maybe one of the reasons that we do not find β2 significant in two out of three specifications above. But overall, this reduced form analysis gives more confidence and credibility to the primary hypothesis in this study and signals the presence of liquidity constraints throughout the economy at the end of Q3 2017. This study indicates how a short term liquidity shock could impact firms in the export sector, which are generally believed to be financially sound. We have shown that the export contributing sectors with high working capital/sales ratio were hit the most due to these liquidity constraints. It is also corroborated by the various measures adopted by the government during November to address the concerns of the exporters. Finally, the exports rebound in November 2017 suggests these quick measures partly addressed the temporary credit constraints faced by the exporters during October 2017. Going forward, it would be interesting to look at the generic reaction of firms in response to working capital crunch. How firms tackled this temporary liquidity crunch can be used to study their short term borrowing behaviour and liquidity management. With firm level data, one can also look at heterogeneity in firm response and identify which firms are more vulnerable to such liquidity shocks. We have provided preliminary evidence for firm level reaction, which can be further extended in future work. Chaney, Thomas (2016), "Liquidity Constrained Exporters", Journal of Economic Dynamics Control, 72: 141-54. Greenaway, David, Alessandra Guariglia and Richard Kneller (2007), "Financial factors and exporting decisions", Journal of International Economics 73 (2), 377-395. Wagner, Joachim (2014), "Credit constraints and exports: a survey of empirical studies using firm-level data", Industrial and Corporate Change, Volume 23, Issue 6, 1477–1492. Exporters have been complaining about delay in grant of refunds pertaining to Integrated Goods and Services Tax (IGST) paid on goods exported out of India and similarly Input Tax credit (ITC) on exports. There are media reports with exaggerated estimations of refund amounts which are held up for the period July to October 2017. It is clarified that the quantum of IGST refund claims as filed through shipping bills during the period July to October 2017, is approximately Rs 6500 Crores and the quantum of refund of unutilized credit on inputs or input services, as per the RFD 01A applications filed on GSTN portal, is to the tune of Rs 30 Crores. With regard to IGST paid on goods exported out of India, majority of refund claims for exports made in July, 2017 where due have been sanctioned. Refund claims of IGST paid for exports made in August, September and October 2017 are being sanctioned seamlessly wherever returns have been accurately filed. The prerequisites for sanction of refund of IGST paid are filing of GSTR 3 B and table 6A of GSTR 1 on the GSTN portal and Shipping Bill on Customs EDI system by the exporter. It is essential that exporters should ensure that there is no discrepancy in the information furnished in Table 6A of GSTR 1 and the Shipping Bill. It has been observed that certain common errors such as incorrect Shipping Bill number in GSTR1, mis-match of invoice number and IGST amount paid, wrong bank account etc. are being committed by exporters while filing their returns. These errors are the sole reason for delay in grant of refunds, or rejection thereof. While information has been made available to Exporters on the ICEGATE portal if they are registered, they may also contact jurisdictional Customs authorities to check the errors they have committed in furnishing information in GST returns and Shipping Bill, and rectify them at the earliest. As the Customs system is designed to automatically grant refunds without involvement of any officer by matching information that is furnished on GSTN portal and Customs system, the onus is on the exporters to fill in all the details accurately. Exporters may therefore take due precaution to ensure that no errors creep in while filing Table 6A of GSTR 1 of August 2017 and onwards. The facility for filing GSTR 1 for August 2017 would also be ready by 4th December 2017. In case of wrong entries made in July, Table 9 of GSTR 1 of August month would allow amendments to GSTR 1 of July 2017. As far as refund of the unutilized input tax credit on inputs or input services used in making exports is concerned, exporters shall file an application in FORM GST RFD- 01A on the common portal where the amount claimed as refund shall get debited from the electronic credit ledger of the exporter to the extent of the claim. Thereafter, a proof of debit (ARN- Acknowledgement Receipt Number) shall be generated on the GSTN portal, which is to be mentioned on the print out of the FORM GST RFD-01A and to be submitted manually to the jurisdictional officer. The exporters may ensure that all the necessary documentary evidences are submitted along with the Form GST RFD 01A for timely sanction of refund. Exporters are therefore advised to immediately file (a) Table 6A and GSTR 3B, if not already done, for processing of IGST refund (b) RFD 01A on GSTN portal for refund of the unutilized input tax credit on inputs or input services used in making exports and (c) GSTR 1 for August 2017 for amending details provided in July GSTR1 wherever required. Government has taken various measures to alleviate the difficulty and is committed to providing speedy disbursal. *Saurabh Ghosh is Director in the Strategic Research Unit (SRU), Shekhar Tomar is Manager Research, SRU, and Sankalp Mathur is Research Associate, SRU at RBI. The views and opinions expressed in this paper are those of the authors and do not necessarily represent the views of the RBI. 2 For clarity, we did similar exercise for the month of November 2016 to identify any such patterns during demonetization. But the observed data (Figure 5 (bottom) in Appendix) indicates no such relationship. 44 Given that most of the observations do not drop out in this regression, it also means that most of the firms in this sample actually borrow short term in most periods, which is not surprising since CMIE Prowess has mostly listed and large firms.